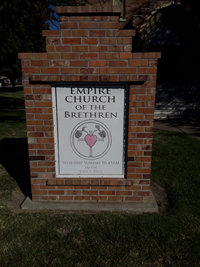 The Empire Church of the Brethren is a congregation of The Church of the Brethren. The Church of the Brethren began in Germany in 1708 to live the Bible as revealed by the Holy Spirit. The first Brethren spent their time in Bible Study to learn how to live like Christ. It was an attempt to re-establish apostolic Christianity. The living of a Christ-Like life. We believe that there are some basic elements that need to be in evidence in how we live our lives for Christ. Some of these are: peace; temperance; the spiritual or simple life, as contrasted to worldliness and luxury; brotherhood; and a religion of the good life, fellowship and harmony with Christ, as against mere creeds and clutus of the churches from which we came. We invite you to come help us live as did Christ our Lord and Savior. This day find forever more. In the following pages you will find the Christian Family known as the Empire Church of the Brethren. As a congregation, and a witness to the community, we are characterized by our obedience to our Lord Jesus Christ, the Son of the Living God, and our service to others. We worship a Living God who teaches us through His Living Word while guiding us through His Holy Spirit. We believe that The Word, The Bible, is a living word which gives life in every situation and is appropriate for each situation in life. We, together, attempt to live this out in our life together and in our love for our community. Since we serve a loving God, being His arms and legs to a hurting world, we show His love through the way we live our lives in service to God and fellow man. In our weekly gatherings, i.e. worship, we come together to study the Word of God, to praise His faithfulness, to support each other and to love our neighbor as we do ourselves. We have a traditional style of worship with praise songs, greeting time, community events, traditional hymns, a time of sharing and prayer, with a sermon based on the Word of God and how it relates to our lives today. We believe that our mission is to reach the world for Christ offering His healing to a broken world. It is our goal to preach good news to the poor, proclaim freedom for the captive, recovery of sight for the blind, to release the oppressed and proclaim the year of the Lord's favor. We believe this to be a literal and figurative ministry in the blind and oppressed world. We hope to accomplish this by living enveloped in the Spirit of Love, lead by the God's Holy Spirit and always together in Christ. To all who receive Him, who believe in His name, He gives power to become Children of God. We welcome you to come join us in this wonderful journey in “The Way” of truth and live. Shalom! May the peace of Christ be with you always.